Yes, I am on the Kombucha bandwagon. This infographic from Tremendo shows the possible health benefits, how to make it, etc. Do I believe it can do all the great things that you may have heard? Not necessarily. So, why do I drink it? I like the taste. I enjoy making it. I love trying new flavors. Maybe someday I will decide I don’t like it anymore. Then I’ll stop. Until then, I enjoy it. What is kombucha anyways? Keeping it simple, it is fermented tea. Start with tea, add sugar, and add your scoby (symbiotic colony/culture of bacteria and yeast). Let everything ferment for at least a week and then you can enjoy your beverage. Here are my instructions to make kombucha. 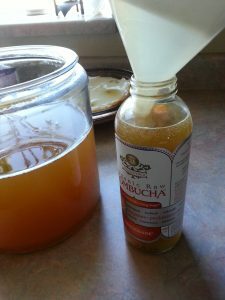 It is a 3 or 4 step process depending on whether you want to flavor your kombucha. If you live in the Phoenix area, I teach a kombucha class. Check the calendar for an upcoming class. I have a scoby for each participant and only charge for the cost of the jar, towel, and instructions. I can also provide a scoby without the class so contact me if you want a scoby. If there is not a scheduled class, contact me to see when the next class is going to be or how you can get a scoby. Here are a couple websites that I found helpful when I started making kombucha on my own – Kombucha Kamp and Becoming Peculiar.